Martin started making pottery in 1997 and soon realized this was what he was meant to do when he was selling every pot he made. He has always been a fan and collector of American Art Pottery - and when he couldn't afford to buy the old pottery that he loved, he decided to learn how to make them. A native Floridian, his pots are decorated with the beauty of the nature of Florida. Be it Spanish moss hanging from old oak trees or alligators lounging in the swamps. He says that he can't imagine ever running out of inspiration! Janet wraps, weaves and knits Sterling Silver and 14K Gold FIlled wire to created one-of-a-kind pieces of wearable art. Her wire wrap pieces are distinctive in their clean lines that work to enhance and frame the stone or piece rather than obscure it. Her pieces include natural stones, shell, fused glass, and ceramic. She has collaborated with Martin Cushman over the past several years to create jewelry using his exquisite hand-crafted ceramic miniatures. 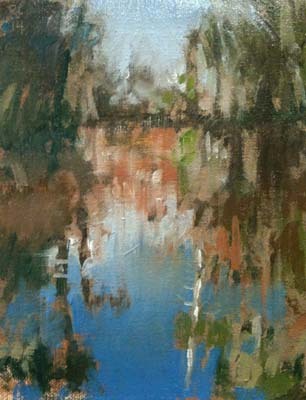 Cathy is a Plein Air Landscape artist. Plein Air is a french term used for paintings made directly from nature and infused with a feeling of open air. Cathy says that she tries to absorb sight to sound and temperature to atmosphere and then channel those feelings from head to hand to recreate a vision with her oil paints on canvas for viewers to enjoy. Occasionally when traveling she will use watercolors to do little sketches of far away places. Her hope is that viewers can escape into her paintings and enjoy them for many years. Kaye is a master basket maker - weaving long leaf pine needles that she collects from her yard in Altoona, Florida into amazing works of art. She often incorporates other items such as oyster shells and wood carvings into her intricately woven pieces. Maurice retired as President of an Industrial Engineering company in Orlando in 2009. He has since devoted his time to enhancing his stained glass and woodworking skills. He recently moved to Mount Dora to get away from the city congestion and get back to his small town roots. Maurice’s major focus in on combining elements of both realism and abstraction in his work. On a recent trip to the Rocky Mountains he collected a variety raw crystals which he is currently incorporating into his stained glass creations. The current director of the Lake Eustis Museum of Art, Richard is an artist and museum professional who brings an alternative viewpoint to his work in both traditional and contemporary. Born in Olathe, Kansas (1957), Colvin's family relocated to Florida in the mid 1960s. Colvin received an art education courtesy of a succession of mentors: Barbara Bassett at the Art Workshop in Winter Park, Thomas F. Peterson at Rollins College, and through observing Central Florida's legendary painter/printmakers, including Maury Hurt, Bill Orr, Jerry Raidiger, and many others. In craftsmanship and spirit, Colvin's greatest mentor is his father, Ronald P. Colvin. 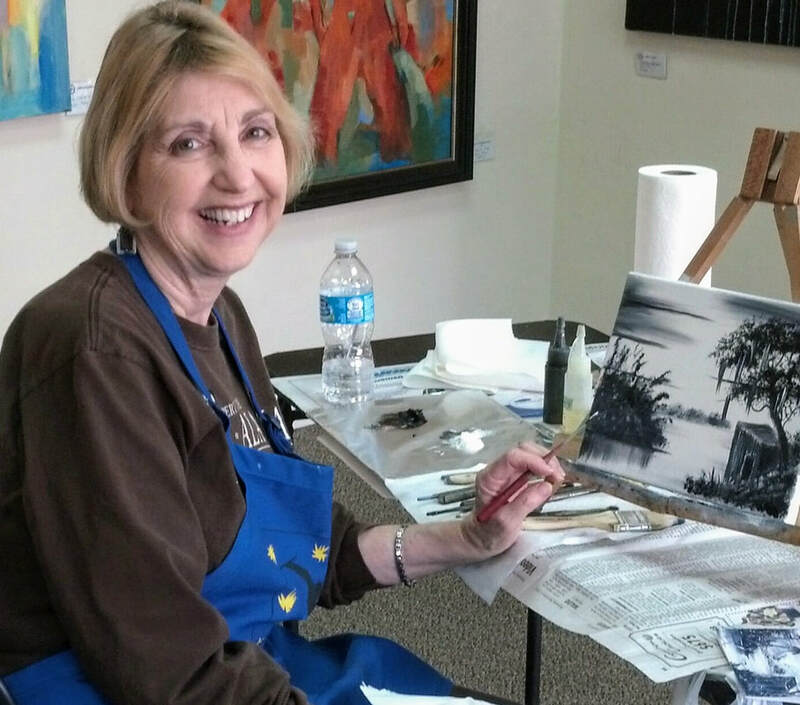 Susan loves to create - and she loves to express her creative self with watercolor. Her favorite subjects are those from nature. Sometimes her paintings are done in the more traditional style, but she also loves to experiment with new techniques just to see what happens. Her attention to detail - not just with the primary subject of her paintings - but also to the all important background is wonderful. Susan has won numerous awards in Florida and Cincinnati Ohio. 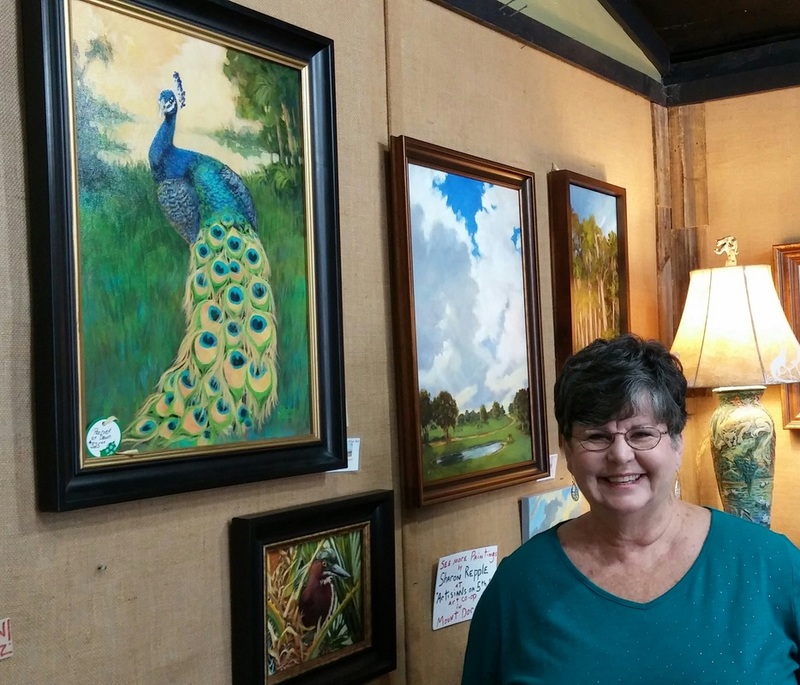 She is a member of the Florida Watercolor Society, Central Florida Watercolor Society, Mount Dora Art League, and Mount Dora Center For the Arts. You can view her work by visiting Florida Faience Gallery, Mount Dora Florida, The Gatehouse, Mount Dora Florida, So Bo Gallery, Winter Garden, Fla., One Main Gallery in Milford Ohio, and Cincinnati Nature Center gift shop, Milford Ohio, Contact her at artbysusang@gmail.com. Jennifer specializes in relief printmaking. Her designs are intricate and beautiful - cut into surfaces such as linoleum, wood, or scratchboard where lines of light are cut into a dark surface. Her prints are in small editions of 20 or less, within which Jennifer often creates many variations - making each print a unique and beautiful piece of art. David is a printmaker who specializes in creating etchings which involves using acid to etch lines into a hard metal plate, and then using that plate to make prints. Each print is unique because the plate wears down a bit with each run through the press. This causes small changes in the image and the tone of the lines. Additionally, the plate must be re-inked by hand for each print, which also results in minor differences between the prints. To maintain the integrity and quality of the image, he only print editions of 100 prints. Each print is signed and numbered. 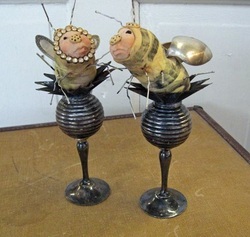 Lynn has studied various mediums in her creative career. She has moved from the basics of charcoals and acrylics to fused glass, photography, pottery, basketry, and finally, to oils. Growing up and studying in Florida, Lynn continues to perfect her craft. 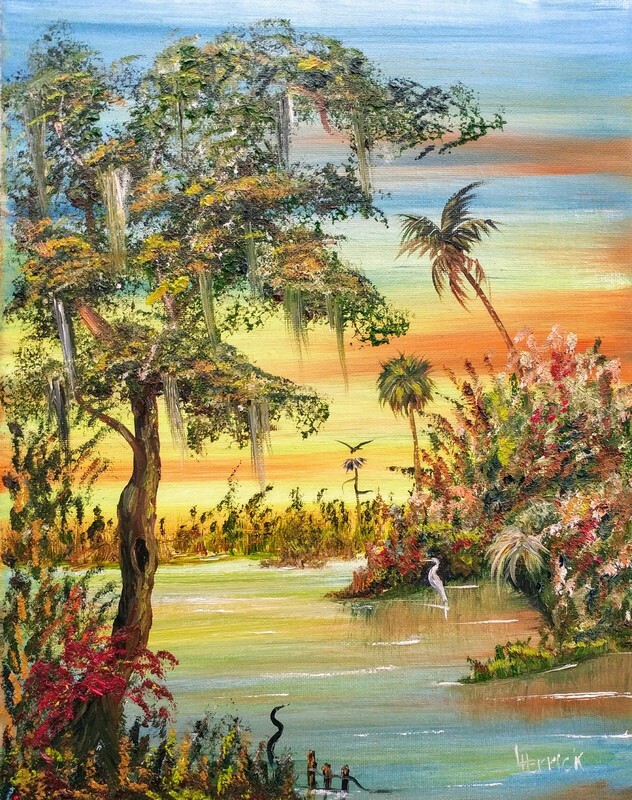 For the past few years she has been trained by the renowned Highwaymen Artist, R.L. Lewis, Jr. in his unique painting style. 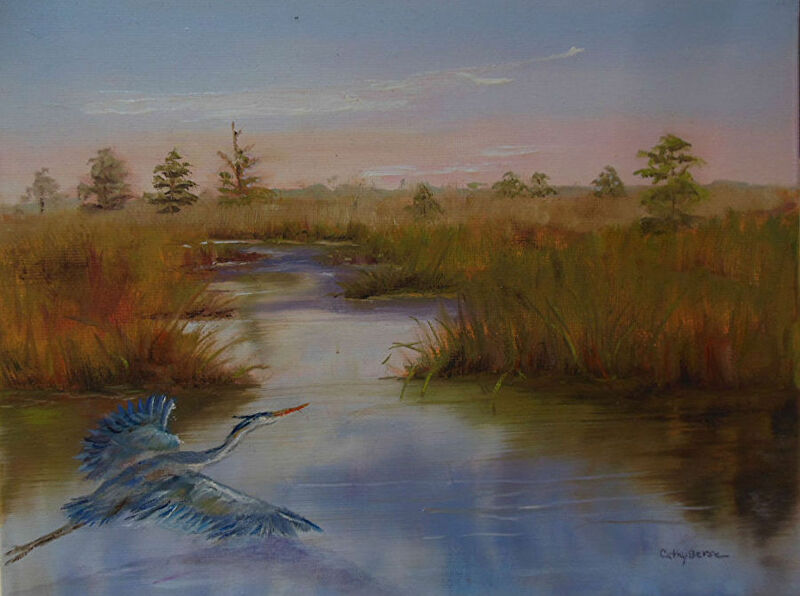 She acknowledges The Highwaymen Artists by always including a black wading bird in each of her paintings. It is through her “Vanishing Florida” series that she pays homage to a incredible Florida landscape that is rapidly disappearing. Jackii Molsick is a painter who enjoys exploring a variety of subject matter and media. She considers herself a watercolorist, first and foremost, but from time to time, she also enjoys explorations in collage, oil and pastel. Her paintings reflect her love of nature, animals, people, travel and nostalgia. Jackii has painted since childhood. She grew up with a mother who was an accomplished oil and watercolor painter. She has also studied with many modern day watercolor masters, including Mel Stabin, Tony Couch, Janet Rogers, Frank Webb and Fred Graff. Today, she is fortunate to teach watercolor at the Mount Dora Center for the Arts, and to maintain a working studio in Mount Dora, Florida. 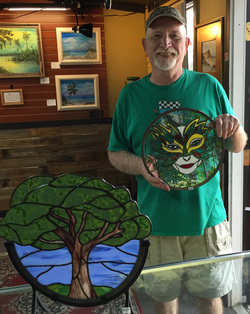 Sharon has always loved to create and with the encouragement from her high school art teacher, Dorthea Cox, as well as her family, art has become an integral part of her life. She says that her paintings are inspired by "the beauty of God's Creation" and that she "strives to reflect His canvas" in her work. 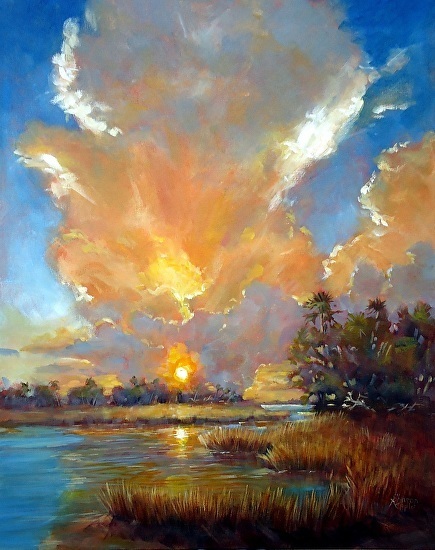 Her landscapes are representative of those found in the coastal areas of Georgia and Florida where she has lived. 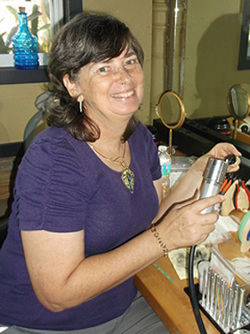 Primarily self-taught, Sharon has recently taken workshops with Lynn Ferris, Stephen Bach and Mary Segars. Even though she has only been able to fully devote herself to her art since 2007, she has taken the art world by storm and has garnered several prestigious awards including winning the Outstanding Acrylic Award in the June 2014 Bold Brush Competition for her work 'The Light Show' pictured to the left. Mike Solomon creates free-form raku sculptures that are both beautiful and functional - as they can often be used as oil lamps.